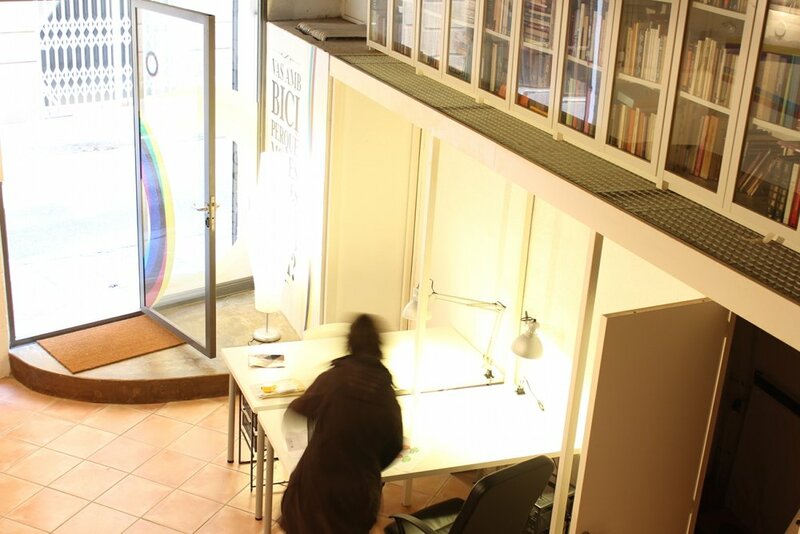 In the heart of El Raval you can find RavalCo, the Coworking Space for independent professionals and entrepreneurs. Here creative minds and freelancers alike come together to work, to exchange ideas and to get their projects off the ground. In a pleasant and open work environment you gain flexibility to your working schedule and the chance to interact with other motivated coworkers leading to a innovative and creative community. Located in the historic center of Barcelona we are easily reached via Metro or busses, by bike or just by walking. Flexible or fixed workstations, space for events and seminars, a lounge to meet or relax, free internet access, wifi and national calls is offered. The use of printer, scanner and fax is of course a given. There is also a small kitchen with an espresso machine, a kettle, a fridge and a microwave. The coworking space used as your virtual office, you can get your postal mail sent to our address. During the last years the district of El Raval developed strongly. In the neighbourhood of RavalCo there settled many creative minds such as architects, artists, designers and translators. Still being a young innovative venture we just gain a foothold here in Barcelona. If you want to contact us, you can use our form, send us an email at info2@ravalco.org, call +34 646 068 450 or come and see our space live, at Sant Vicenç 21, 08001 Barcelona. Community or individual, half day or full day, daily, weekly or monthly - there's an option for you and if not, let's speak about it. From 89€ monthly for the half day, 125€ monthly for the all-day community or 130€ for the individual full day desk. Designers, architects, software engineers, webworkers, translators, all feel equally well here and work together. You're not alone? Special prices if you come accompanied, and special prices if you stay more than two months. And if you're not sure if RavalCo is your space, try it for free one day. From airprint to full access to the space even during weekends and outside normal office hours. From espresso and tea, microwave and fridge to a dedicated eating space. Send us a message to info2@ravalco.org. Monthly, weekly and daily plans for every possible need. If you don't find yours, ask us. You do not simply need a space, you want to feel comfortable and work side by side with nice coworkers. You can contact us directly at RavalCo, call +34 646 068 450, Ping me on WhatsApp or come and have a look at Sant Vicenç 21 or simply fill out the form below.